Getting off the fence. Ever since I qualified for the Boston Marathon last October, I’ve been considering running another one to try and improve my time enough to actually get in and run it. This week, I got off the fence and signed up for the Foot Traffic Flat Marathon, where I ran a half marathon last year. Making the commitment has me training more effectively and feeling excited about the challenge. Taxes. Well, my taxes aren’t done, done, but as soon as I’m finished with this post, I’m off to deliver everything to my accountant. I always like to get this off my plate before my birthday, and I’m just squeaking in this year. But yay, done! Disorder. I’ve let my space get way more cluttered than I’m comfortable with. A couple of big projects, involving lots of paper and pens and post-its and blah, blah, blah. Then the putting off of handling mail has created extra stacks. Apparently the theory is I don’t have time to put that stuff away, so I’ll wait until I do. But the clutter makes it physically difficult to work, not to mention mentally. I’m sure that I spend more time regretting letting the clutter build up, once it has, than I would spend putting things away when I’m done with them. Talk about lying to myself. Structure. Despite trying to, or at least thinking I should be able to, operate without much in the way of structure past results show that some structure is really useful for me. As Artist-in-Residence at The Guild, Cairene MacDonald’s fabulous new program for “purposeful, inspired, accountable, completion”, I’m discovering a new way to create structure for a new project (or two). I have never done this much planning before embarking on a project, and while part of me is anxious to get going with it already, most of me is relaxing into this process, and really looking forward to moving through it all from beginning to end with purposeful intention. I will neither confirm nor deny that on of my projects has to do with this. 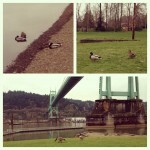 Photo: Duck Duck Goose, taken at Cathedral Park, during a break from writing.